Bailey– Bailey refers to Leonard Bailey, a designer and plane maker who patented several designs for hand planes in the mid 1800s. In 1869, Stanley Rule & Level bought seven patent rights to his designs. While their relationship with Mr. Bailey only lasted until 1875, Stanley retained the patent rights and eventually the use of the Bailey name. Stanley’s standard line of bench planes are commonly referred to as Bailey planes, and throughout the years many were cast with the Bailey name at the toe. Bed – The bed is the top surface of the plane’s main body. Very similar to the deck of a boat, the bed is the area where all the hardware – knob, tote, and frog are attached. Bedrock – Bedrock planes were Stanley’s premium line of bench planes. While the earliest models had rounded sides identical to the standard Bailey bench plane offering, Bedrocks are best known for their flat top sides, a feature added in 1911. Bedrocks are primarily differentiated through the design of their frogs and how they mount to the bed of the plane. Bedrock frogs feature a larger mating surface and a more advanced adjustment mechanism. The face of the frog on which the iron assembly rests has a greater surface area as well. The purpose for all of these features was to better stabilize the frog and iron to reduce the possibility of unintended movement during use. Introduced in 1898, the last of the Bedrocks were discontinued in 1943. Body – Whether made of cast iron, steel, aluminum, or wood, the body is the main frame of the plane to which all the other parts attach, and which rides across the wood surface to be planed. The top side is often referred to as the bed, and the bottom is called the sole. It adds rigidity to the iron. It provides a small opening through which the depth adjustment mechanism engages the iron. It helps ‘break’ the shavings as they rise off the cutting edge of the iron, thus preventing them from jamming up the throat of the plane. Cap Iron Screw – The broad, flat, shallow screw about the size of a nickel that attaches the cap iron to the iron. Cheek – The cheeks are the sides of a plane’s body. On most bench and block planes, the cheeks are flat and 90 degrees to the sole. However, the cheeks on some designs of early Bailey planes and British infill planes were curved, or boat-shaped. Depth Adjusting Nut – The large knob on the rear of the frog used to raise and lower the iron. On Stanley planes made through about 1918, the depth adjustment nut was 1 inch diameter. Those made after 1918 were 1-1/4 inches diameter. Most manufacturers used brass for their depth adjustment nuts, but not all. Some used steel nuts and even Stanley switched to hard rubber and blued steel nuts briefly during WWII. Frog – This unlikely named part is the angled fixture upon which the iron is secured. Whether removable, as on bench planes, or fixed, as on block planes, the seat that supports the iron is called the frog. Frog Adjuster Screw – Stanley introduced a mechanism to make longitudinal adjustments to their frogs in 1907. At the rear of the raised seat on the bed of the plane to which the frog is attached, a bolt-like screw was added. Called the frog adjuster screw, it engages the adjuster tab that was added to the bottom rear of the frog. By turning this screw, the frog could be moved forward or backward, the effect of which was to open or close the throat of the plane. This feature was present on all Stanley planes from 1907 on, although there were a few examples made during WWII that are found missing the both the adjustment hardware and their mounting holes. Frog Adjuster Tab – This rectangular tab had a slot on the bottom that engaged the frog adjuster screw (see above). This tab and is mounting screw were blued up until sometime in the late 1930s or early 1940s, although there doesn’t appear to be a clear transition date. Post WWII the tab and screw were usually nickel-plated. Frog Adjuster Tab Screw – This small screw attached the frog adjuster tab to the rear of the frog (see above). Frog Hold Down Pins – These pins are unique to the Bedrock series of planes. Unlike the Bailey series of planes, which used threaded bolt-like screws to attach the frog to the bed of the plane, Bedrocks used smooth, unthreaded hold down pins. Each pin had a conical hole in the lower end, which was engaged by a pointed locking screw that attached from the rear of the frog mounting base on the plane’s bed. Frog Locking Screws – Frogs on most bench planes, regardless of manufacturer, were secured to the bed of the plane via a pair of frog locking screws with separate round washers. These were simple bolt-like screws slotted on top and tightened with a screwdriver. The frog seat on the bed of the plane had threaded holes to accept the screws. Heel – The rear of a plane’s body. Iron – ‘Iron’ is the correct traditional term for a plane’s cutting implement. The terms iron, cutter, and blade are often used interchangeably. Plane irons are flat on one side and have a single bevel on the other. The bevel is usually sharpened at 25 degrees, although it is common practice today to hone a second ‘micro-bevel’ at 1 or 2 degrees. The irons on bench planes were traditionally positioned bevel side down, while irons on block planes are typically positioned bevel up. Knob – Knobs on bench and specialty planes were usually made of wood – most often rosewood, cocobolo, or beech, although different manufacturers used different species. Later models featured varnished hardwood and eventually plastic knobs and totes. Knobs on block planes serve as a comfortable and secure rest for your thumb and are made either wood, brass, or nickel-plated brass, depending on the model. Knob Bolt – The knob bolt was typically threaded at both ends; one end attached to the threaded hole at the toe of the plane while the other end received a nut that secured the knob in place. Some knob bolts were single piece affairs with a slotted head on top. Knob Nut – Stanley and most manufacturers used a brass nut to secure their knobs and totes via their respective bolts. While thread count was consistent, sizes and shapes varied through the years, so when sourcing replacements it’s important to find the correct style for the plane’s vintage. Lateral Adjustment Lever – The lateral adjustment lever was added to all Stanley bench planes in 1885 (except the tiny no. 1 plane). Planes made before this feature are often referred to as pre-lateral. The lever is attached to the top of the frog via a rivet. At its lower end there is a circular disk that engages the slot in the cap iron, so that moving the lever back and forth adjusts the lateral positioning of the iron. This is extremely helpful in properly aligning the cutting edge of the iron within the mouth of the plane. Lever Cap – The lever cap secures the iron/cap iron assembly against the face of the frog. Using the head on the lever cap screw as a leverage point, the tab at the top of the lever cap is locked down using its cam action to exert force upon the iron assembly, holding it firmly in place. Lever Cap Screw – This round-headed and slotted screw threads into the hole in the face of the frog. It provides the point of leverage needed to hold the lever cap against the iron/cap iron. Locking Screws – Bedrock planes use a very different method of attaching the frog to the base of the plane than that on the Bailey line. At the center of the rear of the raised seat upon which the frog is attached is the frog adjuster screw, same as on the Bailey planes. However, on either side of this screw are threaded holes through which the locking screws are inserted. These screws have pointed ends that engage the conical holes in the frog hold down pins and hold the frog in place through downward pressure of the pointed locking screws. Mouth – The terms mouth and throat are frequently used interchangeably. Technically, the mouth is the opening in the sole of the plane through which the iron protrudes. The throat is the area just above the mouth on the top side of the body through which the shavings pass. Sole – the sole is the bottom (business surface) of a plane’s body. The sole is milled flat on most bench and block planes, although there are specialty planes with adjustable soles, such as the flexible Stanley no. 20, and curved, such as the convex sole of the no. 100-1/2. Threaded Adjuster Rod – This threaded rod is attached to the back side of the frog and is the mounting post for the depth adjusting nut. The nut threads onto the rod and engages the yoke just above it. Tightening the nut moves it forward, which in turn causes the yoke to pivot upward, thus raising the iron. Loosening the nut does just the opposite, lowering the iron. Throat – The terms mouth and throat are frequently used interchangeably. Technically, the mouth is the opening in the sole of the plane through which the iron protrudes. The throat is the area just above the mouth on the top side of the body through which the shavings pass. 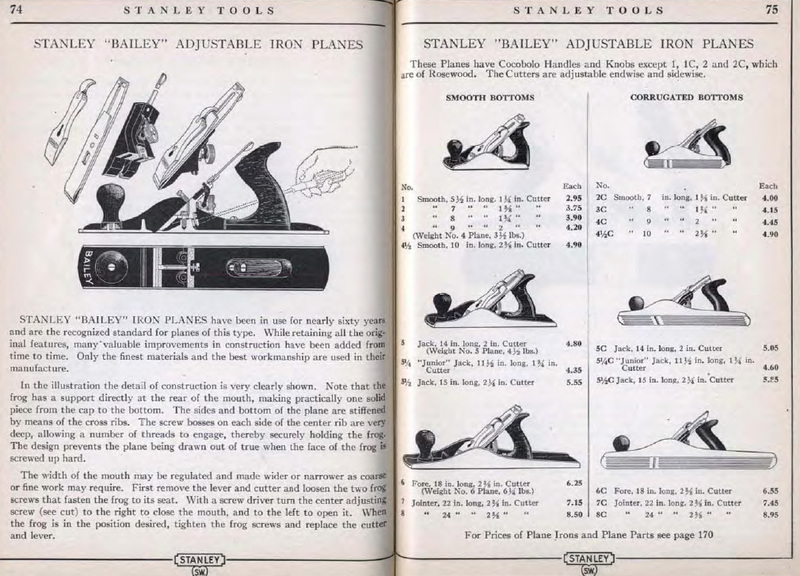 Even the manufacturers were not always consistent in use of the terms, as evidenced by Stanley’s ‘Adjustable Throat Planes.’ Maybe closed throat just sounded better than closed mouth. Toe – The front of a plane’s body. Tote – The rear handle on a plane is called the tote. Like the knob, totes were typically made of rosewood, hardwood, or some other species, depending on the manufacturer. Stanley also offered aluminum totes for a period back in the 1920s and 30s as a more durable option for trade schools and such. Totes on smaller planes are secured via a tote bolt alone, while totes on the larger planes have a screw added at the toe for additional support. Tote Bolt – Identical to the knob bolt, only longer, the tote bolt secured the tote through a hole drilled through its length, capped off by a tote nut. Tote Nut – Stanley and most manufacturers used a brass nut to secure their knobs and totes via their respective bolts. While thread count was consistent, sizes and shapes varied through the years, so when sourcing replacements it’s important to find the correct style for the plane’s vintage. Tote Screw – Totes on the larger bench planes (Stanley 4-1/2 and larger) were held in place by the combination of a tote bolt and a tote screw. The screw was blued at least until WWII. It has a round slotted head and screws into the base of the plane through the toe of the tote. Yoke – The yoke is a small wishbone shaped device that is attached to the top of the frog just above the threaded adjuster rod. Made of cast iron, it is brittle and will easily break. Fortunately, it’s also easily replaced if missing or broken by tapping out its mounting pin from left to right as you hold the frog in your hand looking at its back side. The fork of the yoke engages a wide shoulder notch in the depth adjustment nut. As the nut is turned, the opposite end of the yoke that protrudes through the face of the frog engages the rectangular hole in the cap iron, raising and lowering it. Why is it called the “frog”?